This summer I had two wonderful experiences reading books. The first was reading War and Peace, which took me the better part of the summer, but was one of the most enjoyable reading experiences I have ever had. The second was The Importance of Being Earnest, which I read in an afternoon, laughing out loud at many parts. Completely different works, but both rewarding experiences. I have done some posts on what I do on the second day of school: read a story, read a poem, or look at an image. But on the first day of school I like to set the stage for the study of literature and why it’s important. (Keep in mind, I’m an introvert and ice breakers and get-to-know-you games are pretty high on my list of things I despise, so this is what I do instead.) Many of my students don’t like to read, and many of them – even in an AP class – claim to have gone through their high school education without reading a book in school. Since we will spend our year exploring both classic and popular works of literature, here are the reasons I tell them why everyone should read. A lot of parallels can be drawn here to the Harry Potter series, so I will do so. 1. Books are the containers for the wisdom of the world. For a long time people have used stories to teach important lessons: Aesop’s fables, the Greek myths, and stories from various religions. Storytelling is a powerful way to impart knowledge because it allows people to live the lesson rather than just hear it. Some inferior ways of imparting those lessons fall by the wayside, others that combine these lessons with good storytelling stand the test of time. We can tell people “you never really understand a person until you consider things from his point of view … until you climb into his skin and walk around in it,” but the lesson becomes much more powerful and memorable through the character of Atticus Finch. In a similar fashion, my students have told me that their initial reason for reading Harry Potter is to be immersed in the imaginative world of Hogwart’s. No one really picks up a novel to learn something; first and foremost we want to be entertained. However, there is a great deal of wisdom in the series, such as this quote from Dumbledore: “It is our choices, Harry, that show what we truly are, far more than our abilities.” My students will tell me that upon reading the book a second time, the important themes in this series become clear and relevant if they missed them the first time. This doesn’t guarantee that 100 years from now we’ll be reading Harry Potter or To Kill A Mockingbird, but the lessons that those books impart will appear in literature forever. 2. Books allow us to be part of a community. I would imagine that everyone that has graduated high school in the United States has read (or at least is familiar with) the story of Romeo and Juliet. Knowledge about Romeo and Juliet isn’t particularly useful, but it’s something that we have as a cultural touchstone for all of us. Regardless of the subject matter, there is a great deal of value in having things that all of us know that is part of our shared knowledge. We also form communities around books in the form of book clubs. Some are more serious than others (some I know of are more about drinking wine and gossip rather than about discussing books.) However, The foundation is based on the premise that creating books and building a community around a shared experience is worthwhile. In a similar fashion, those who have read Harry Potter have formed their own communities that keep the stories alive and relevant. They post listicles and memes, plan pilgrimages to the theme park, and write fan fiction about the novels. I would imagine that for these groups of people, anyone who claims to be into Harry Potter who has only seen the movies (or worse, only read the summaries) would be tagged as an impostor by those members of the community. You have to read the books or you’re not a TRUE Harry Potter fan because you haven’t really experienced it. We can say the same for any book that we read. 3. Literature allows us glimpses into the human soul. Everyone is probably familiar with Robert Frost’s “The Road Not Taken,” or at least the last few lines. Here’s the summary of the poem from Gradesaver: “The narrator comes upon a fork in the road while walking through a yellow wood. He considers both paths and concludes that each one is equally well-traveled and appealing. After choosing one of the roads, the narrator tells himself that he will come back to this fork one day in order to try the other road. However, he realizes that it is unlikely that he will ever have the opportunity to come back to this specific point in time because his choice of path will simply lead to other forks in the road (and other decisions). The narrator ends on a nostalgic note, wondering how different things would have been had he chosen the other path.” Not only does this take just as long to read as the poem, but we also can’t argue that it’s the same experience as reading the poem. We haven’t lived the poem like we have when we read it. The summary doesn’t connect to us emotionally. The study of literature is basically the study of an art form that people use to work out the world’s problems. I recently talked to someone who suffered for bulimia for twelve years and one of the ways that she worked through it was by writing daily in here journal. She wasn’t working math problems or doing science experiments. There’s a difference between learning ABOUT a work of literature and experiencing it. We could cover a lot of ground in English classes if we simply read summaries of the great books and memorized why we should read them. But there’s no substitute for immersing yourself in the work and letting it touch your soul. There’s no question that Harry Potter has affected readers in this way. Our hope as educators is to find works that will encourage this same level of engagement. They may need some help along the way from us, but as guides we can show them what great literature has to offer them as they go off into the world. What Should I Do on the Second (or Third) Day Of School? Look at an Image! There is a lot of information out there about what to do on the first day of school. But what should you do on the second day of school to get students engaged in the subject matter of English classes? 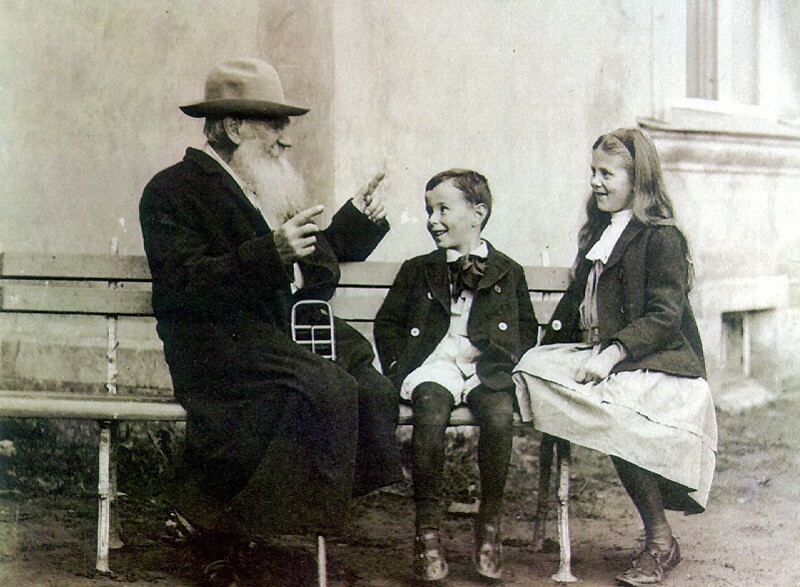 In previous posts I did a post on using the Tolstoy story “Three Questions” to remind students how to interact with text. In another post I did the same with the Mary Oliver poem “Mindful.” In this post I’ll talk about using an image: the Adrian Tomine New Yorker cover above. For this exercise. I ask kids to tell the “story” of the cover. What’s going on here? What does the image communicate to you? For a large number of students, this is a surprisingly difficult task. The know what’s in the picture, but they can’t adequately tell what the image communicates. I tell them to keep looking. Eventually they get it. The image is of a man and a woman with similar interests who might have started a relationship, but will likely never meet again. 2. How were you made to see it? Once they’ve interpreted the image, the next task is to have students determine how they arrived at that conclusion. How do you know that’s the idea that you’re supposed to arrive at? A good question to ask is: what would happen if the man and woman were reading different books? What would be lost? Also: why are their faces the only two you see? Have the students continue to look at the image for more clues to how Tomine put it together. Obviously high school students are interested in relationships, so next I use this image to start a conversation about the strange nature of relationships. Everyday you have the potential of missed opportunities like this: people that could become your best friend or boyfriend or girlfriend (or yikes! Spouse!) but circumstances dictated otherwise. I will often talk about the opposite: the random ways that we sometimes get into relationships with other people. For instance, I met my wife in a graduate school class. If I had not taken that class, or gone to a different school, or picked a different undergraduate major, we wouldn’t be married. Of course there are students that believe that there is only one soul mate for each person and you’ll find that person eventually no matter what. That’s a great discussion too! Obviously working with an image like this involved the same analytical skills that we want students to approach anything they read or see. We want them to not only understand it, but develop an understanding of how it works through repeated readings and close analysis. You could follow this activity with either the story or poem from previous posts. 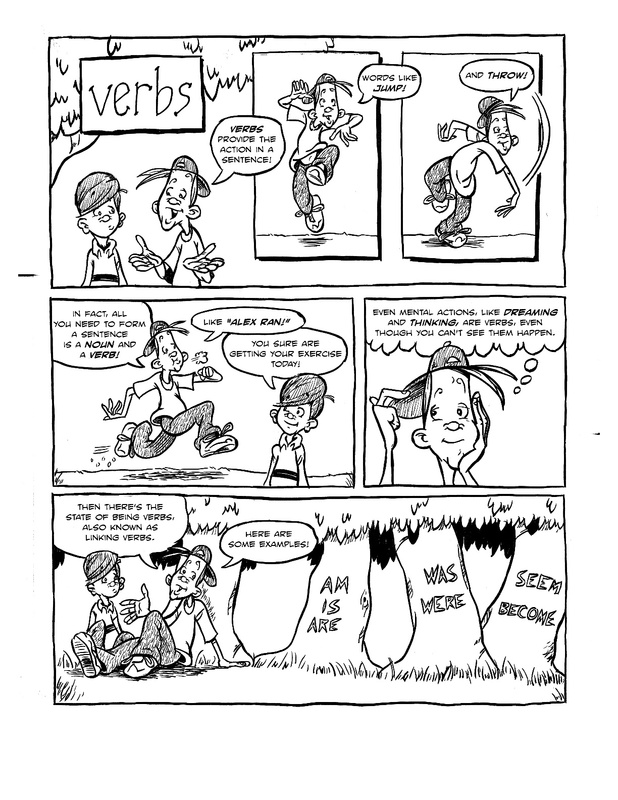 If you’re looking for a fun way to review the Parts of Speech during the first week of school, check out my set of comics and activities called Grammar Comics: Parts of Speech. More great teaching activities can be found at my store. Follow me on Facebook for freebies and giveaways! What Should I Do On the Second Day of English Class? Read A Poem! There are a lot of suggestions floating around out there about what to do on the first day of school. But what should you do on the second day in Language Arts? I already did a post on using a short story to establish how you approach the task of reading. In this post I’m going to do a similar activity with a poem. The poem I’m going to use for this activity is “Mindful” by Mary Oliver. It’s a pretty easy poem, but there’s just enough in there the students will find difficult that will get their brains working. Also, Oliver is a very inspirational poet, and I find that students like the positive, contemplative aspects of her work. Poetry can be a tough sell for kids anyway, so starting off with Sylvia Plath or John Donne is probably not the way to go. So let’s stick with Oliver. Here’s a link to the poem. 1.Where do you get stuck? This is a poem where kids will go along swimmingly until they get to the middle, I’m guessing right around the “nor.” A lot of poems work this way, and I find that I have to train kids not to bail out too quickly because the heart of the poem is often in the last few lines. So the next question is: what tools do you have at your disposal for when you get stuck? Obviously you can reread, and that’s almost a requirement for any poem to be experienced fully. Are there any words that you don’t understand, like “acclamation” (which is different than “acclimation”)? Anything that’s worded in a strange way? Most importantly, do you need to know what that word or phrases means to understand the poem? Sometimes you don’t. 2. Who is the speaker? Obviously it’s important to train kids not to assume the poet is the speaker, but in this case it doesn’t make much difference if they do. What we’re getting at with this question is not just inferences but textual support. 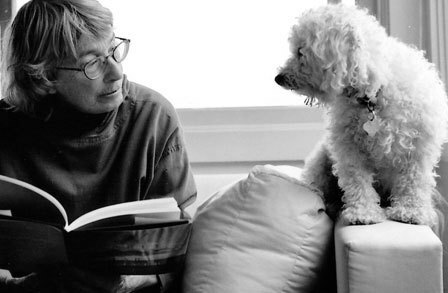 If this were the only poem you read by Mary Oliver, what could you tell about her and how do you know? What are her character traits? What does she like to do? Where does she like to be? And where do you see it in the text? 3. What’s the main idea? The dreaded question! Kids don’t like this one because it gives them the greatest chance of being wrong. But this poem has a pretty easy message to figure out: there is great wisdom to be found in everyday experiences if we simply allow ourselves the time to see them. This is a great message in a world in which we are overly reliant on technology, but I think it’s a particularly important message for my seniors, many of whom have spend so much time chasing after grades and activities that them have left themselves very little time to pause and figure out who they are. I know several students from the past that graduated and found themselves adrift for this very reason. I’m going to do a Mary Oliver unit later in the year and this will be one of the activities that I’ll do, but it would be a good second day activity as well. I would have them look at something they find for much longer than they would have to see what they notice and take a picture of it. It could be anything – a flower, the front yard, anything that you see on a daily basis that you don’t give much thought to. Here’s an article about how to take mindful photographs you could use. You could even have them write a poem that accompanies the photograph, or create a bulletin board from all the pictures that people have taken. What fun! So What Do I Do On The Second Day of English Class? Read A Story! There are a lot of posts out there on what to do on the first day of school: set expectations, go over the syllabus, do some icebreakers, go get textbooks, cry that your summer is officially over. But what do you do on the second day when it’s time to start in with your subject matter? How as, language arts teachers, can we set the stage for what our students will do during the year, and how do we teach them how to interact with texts? This year I’m going to try something new. I always like to use the first week to orient students to the way my class is run. Here’s how we discuss stories. Here’s how you annotate. Here’s what happens when you look at a story more than once. But I always struggle with what I want my students to read first. For this purpose I’m going to use Tolstoy’s story “The Three Questions.” I won’t tell you the whole story; you can read it if you follow the link. It’s not terribly long, which means I can easily read it and discuss it in a class period. The gist of the story is that a king goes in search of the answer to three questions that he believes will make him a good ruler: what was the right time for every action, who were the most necessary people, and how he might know what was the most important thing to do. It’s a positive story, and very inspiring. Who doesn’t want to inspire their students on day two? I have toyed with the idea of giving them the questions at the beginning of the period and seeing what they come up with as answers. I might do this. A simple way to get students to respond to the story would be to have them ask three questions about the story. They aren’t trying to come up with a quiz. They should be things that they wondered about as they read. What did you find interesting? What did you find revealing? Those are some good questions to prompt responses. A good way to accomplish this is with a second read, especially with a story of this length. Students will be able to see stuff that they didn’t see the first time now that they don’t have to worry about the plot. One of the questions that I hope a student will ask is: Are these the only possible answers to these questions? If no one poses that question, I will ask them. 2. Examine how stories work. I firmly believe that stories hold the wisdom of the world, and this is certainly true for this story. But it’s also a good way to examine how stories work their magic. One question to ask is: why a story? Tolstoy could have just told us the answers to the questions. What’s the power of embedding it in a story, and a pretty common story structure at that? Furthermore, Why not just have a guy come to the hermit, ask the question, get the answer and move on? Why does the story have to be told in this particular way? What do the all the details add to make it a more effective story? 3. Come up with a fourth question. This last activity is a good “get to know you” type of question: if you could ask a fourth question, what would it be? And do you have any sense of what the answer might be? This questions could be done in groups as well. Pose a fourth question that you think will provide you some sort of significant insight into your life.